Chamberlin transferred from Nebraska Wesleyan to the Univ. of Nebraska and was a consensus first-team All-American end in 1915. Following military service from 1917 to ’19, he joined Canton in 1919, when it was still part of the informal Ohio League, and moved on to the Decatur Staleys of the new NFL (then called American Professional Football Association) in ’20. Tall and fast, and outstanding on both offense and defense, Chamberlin received first-team All-League honors from The Rock Island Argus. The club shifted to Chicago in 1921 (and was rechristened the Bears the next year) and won the NFL Championship. Chamberlin returned to Canton as player/coach in 1922. Bulldogs went 10-0-2 to finish first in the NFL while leading the league in touchdowns (26) and scoring (184 points). The Bulldogs went undefeated in 1923 to again top the NFL with an 11-0-1 record under Chamberlin’s guidance, and as a player he received first-team All-NFL honors from Collyers Eye and second-team recognition from the Green Bay Press-Gazette. The franchise was effectively shifted to Cleveland in 1924 and won another title. Chamberlin received first-team All-NFL honors from Collyers Eye. He moved on to become player/coach of the Frankford Yellow Jackets in 1925 and, after a sixth-place finish that year, they topped the NFL with a 14-1-2 record in ’26. 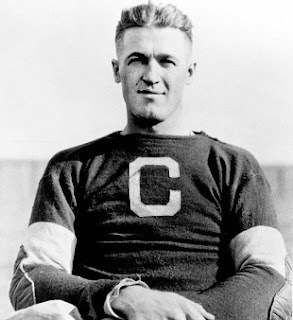 Chamberlin ended up as both a player and coach with the Chicago Cardinals in 1927, who placed ninth with the only losing record of any team that he played for or coached. Overall, as a player Chamberlin played in 92 games and scored 17 touchdowns, and received at least some first-team All-League recognition four times. As a coach, his teams went 58-16-7, including 21-0-3 in two seasons with Canton, and won a total of four NFL Championships. Chamberlin was inducted into the Pro Football Hall of Fame, Class of 1965.